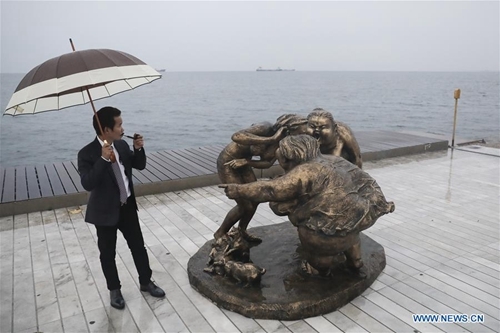 Chinese artist Xu Hongfei, president of the Guangzhou Sculpture Academy, "introduced" 15 of his sculptures of female figures to the port city of Thessaloniki in northern Greece, as part of a global tour of his exhibition. The inauguration of the open-air show on Tuesday was carried out by the Union of Chinese Traders in Greece and the Municipality of Thessaloniki. 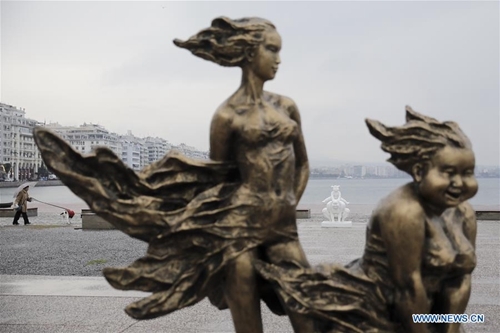 Five sculptures of his curvy women were placed behind the Royal Theatre which hosts the National Theatre of Northern Greece, and another 10 in Pier A of Thessaloniki Port Authority. They will remain in the Greek city until Dec. 24. The aim of the event, according to the organizers, was to present Thessaloniki and Guangzhou, the capital and most populous city of the province of Guangdong in southern China, to the world, combining Chinese art and the unique charm of Greek civilization in order to enhance communication and cooperation between them. "Thessaloniki is the 30th stop of my word tour. Greece is also the birthplace of western art, a country I always dreamed of visiting. 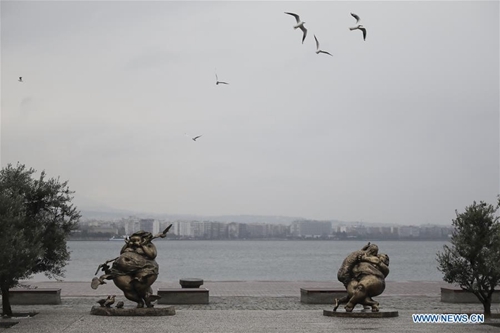 Guangzhou and Thessaloniki have a long distance between them, yet the first is one of the main cultural centers in Greece and the other is the birthplace of the Cantonese culture. Both cities have a long history and a rich culture. I wish this exhibition would be the meeting point of these two cities under this intense artistic atmosphere," Xu said in his greeting during the opening ceremony. The Chinese artist who explores the female figure drawing inspiration from the lives of ordinary women in China, as he has said, has exhibited his works from Australia and the United States to Italy and Colombia. 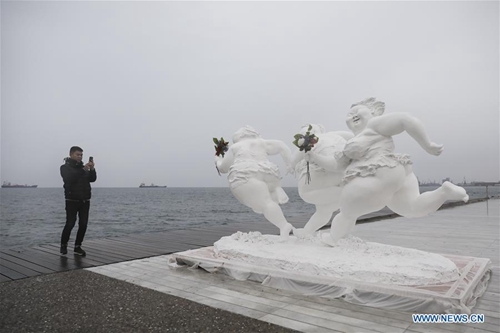 "Those of us who have studied Sculpture Art have always admired the Greek sculpture, the ancient statues and especially Aphrodite of Milos, and I am glad that I could bring my chubby women to the birthplace of Aphrodite," he told Xinhua. "We are very happy to have some samples of Chinese art at the most iconic place of Thessaloniki, next to the White Tower monument. Many people will have the pleasure of visiting and admiring them, and this is the best way to deepen relations between Greece and China in the culture," Deputy Regional Governor for Culture and Tourism, Alexandros Thanos, noted in his speech.